Do you have a favorite Sunday dinner? When I was growing up, my family rarely had the opportunity sit down together for a meal during the week. Between after school activities, dance classes, track practices, and homework…we were lucky to eat something while even sitting at all! 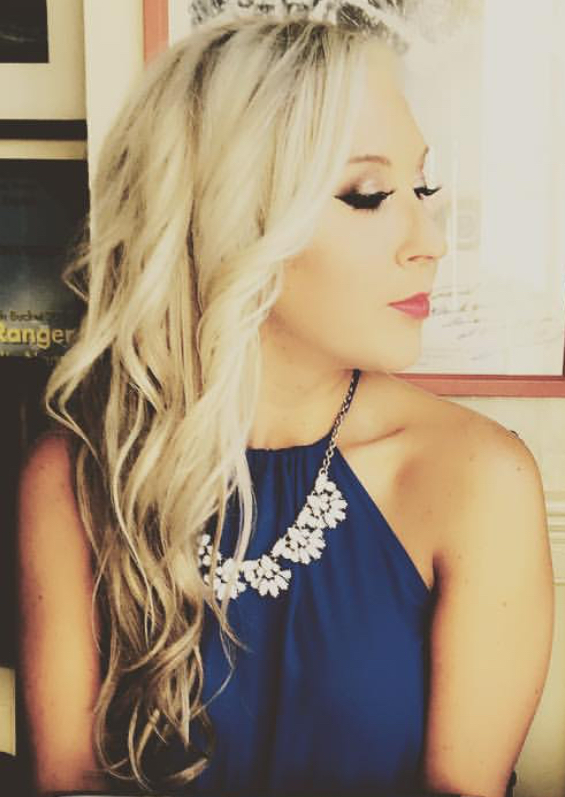 The only exception to this hectic routine was Sunday nights, when my dad would spend the day cooking a big meal and we would all sit down to eat together as a family. I have to admit, my dad is a pretty amazing cook. Give him a handful of ingredients (any ingredients!) and he’ll whip up a gourmet meal in no time. Actually, that’s a lie. He would spend the WHOLE DAY taking his time to perfect a recipe…and though waiting was the hardest part, it would always be worth it in the end. One of these gourmet meals that seemed simple but took FOREVER was Sunday spaghetti. The secret was his simmer-all-day-long, made-from-scratch pasta sauce with a *special ingredient. * Sorry, I can’t tell you what it is! My dad would begin prepping in the morning and wouldn’t finish cooking until dinner was ready to go on the table that night. Normally, my dad would make the sauce with ground beef, but once I declared myself a vegetarian, he’d set aside a small pot of meat-free sauce just for me. Sometimes he would use the same sauce to make eggplant parmesan…one of my favorite vegetarian (non-vegan friendly) meals before giving up cheese! It’s been a long time since my family has had one of those Sunday night dinners, but my boyfriend reminded me of them when he spent all day today making his favorite Sunday comfort food– spaghetti and meatballs. I was getting sick of my run of the mill Sunday night salads, so I decided to change it up a bit by putting a healthy spin on another popular type of comfort food…BARBEQUE! I rarely use the conventional oven to cook my meals, especially on a weekend. Funny, I know. Here I am writing a recipe blog and I hardly use the most important cooking appliance in my kitchen to make myself dinner! But honestly, I’m usually so wiped out from going to the gym, running errands, cleaning, testing recipes, and baking healthy treats…that by the time the dinner hour rolls around, I’d rather throw some lettuce in a bowl and call it a day. But today…the boyfriend inspired me. I’ve decided to try something new. I’ve been itching to wear my new, gold Gap flip-flops but it was rather chilly today in Boston. The sandals will have to wait another day, but who says I can’t eat like it’s summer right now? When I think summer, I think BBQ. I think about summers at the family’s beach house, corn on the cob, campfires, and grilling. 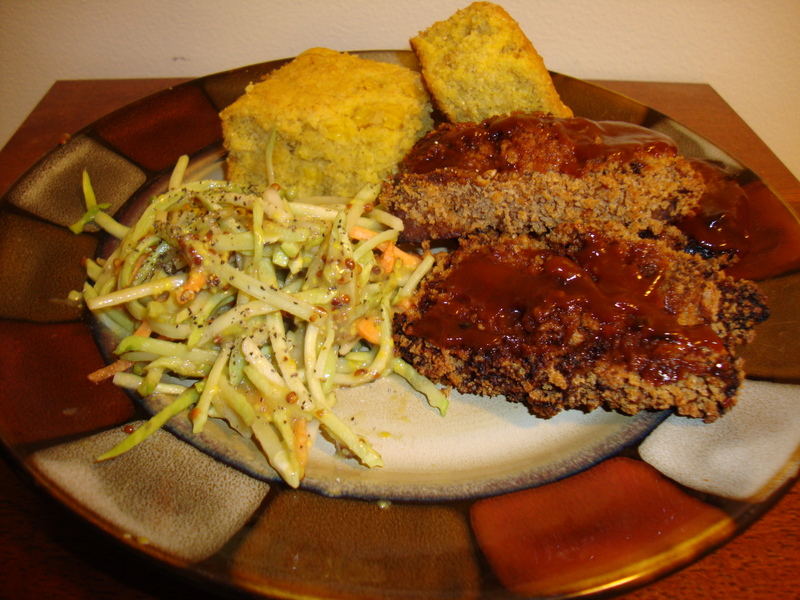 I knew JUST what to whip up– Extra Crispy BBQ tofu, ahhh-maaazing, fat-free, country cornbread, and a side of summer slaw. Can you hear the summer peepers in the trees and the crackling of the campfire yet? Extra Crispy BBQ Tofu & Summer Slaw: A high-protein, low-fat, twist on a summer favorite! Take the tofu out of the package and pat dry with paper towels. Wrap tofu in a couple sheets of paper towels, set on a plate and put another heavy plate on top of it as if you are making a tofu/plate sandwich. This will help get any excess moisture out of the tofu before cooking. Put tinfoil on a cookie sheet and spritz with all-natural cooking spray. Unwrap the tofu and slice it into 7 pieces (you can cut it thicker or thinner depending upon how crispy/soft you want it to be). Sprinkle the tofu with garlic powder and onion powder. Take you first piece of tofu and dip it in the BBQ sauce, making sure the entire piece is coated. Dip your BBQ tofu in the breadcrumbs and place it on your cookie sheet. Again, make sure all sides are breaded! Continue coating and breading the remaining tofu slices. Place your cookie sheet/tofu in the oven and bake for 40-45 minutes (flip half way through). I like my tofu EXTRA crispy, so if you prefer softer tofu, just don’t keep it in as long. Drizzle some more BBQ sauce (or even all-naural ketchup!) on top for an extra kick! 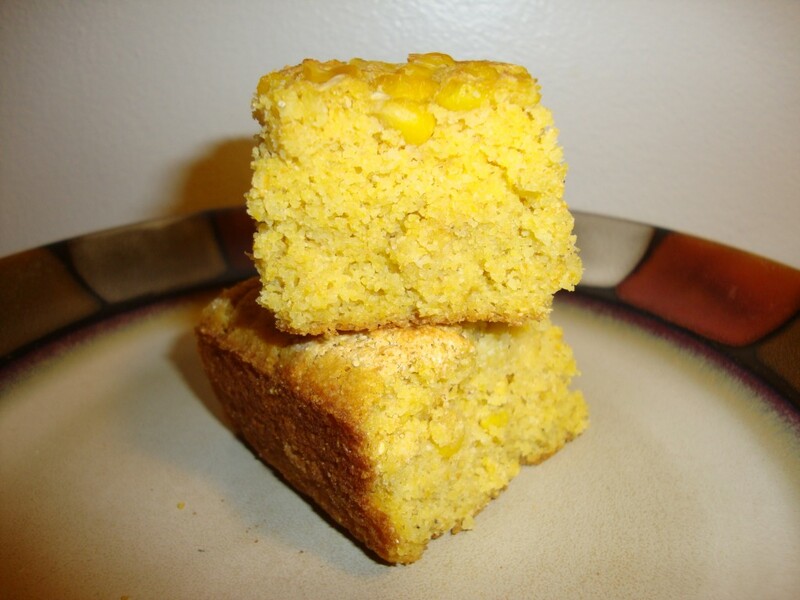 Ahhhh-Mazzzzing Fat-Free Country Cornbread: Sweet and savory…without the guilt or gluten! I'm sooo sweet....and FAT FREE! Blend all the wet ingredients together (I used a magic bullet to blend mine because I didn’t want my cornbread to have whole bits of corn in it, but I am sure it would taste great either way). Add the wet ingredients into the dry ingredients and mix well. Pour batter into pan and sprinkle with remaining corn.